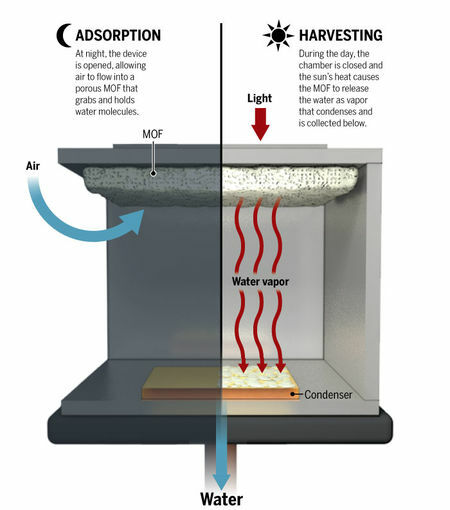 Scientists have developed a simple tool that can soak water from the air and leave it with the warmth of sunlight. Researchers said that this finding can provide a new safe source of drinking water in remote desert areas. The Earth's atmosphere has around 13 thousand billion tons of water in the world. Many tools were developed to get this water but they proved to be either incompetent or expensive and complex in this work. Researchers from King Abdullah University of Science and Technology, Saudi Arabia have developed a new tool in which cheap, stable, poisonous salt and calcium chloride are used. To achieve this milestone the major hurdle to researchers is that Calcium Chloride has great-water harvesting potential, but the fact it turns from a solid to salty liquid after absorbing water.